Sitra and two energy partners are investigating the possibility of exploiting the benefits of district heating systems. Could district heating customers start selling heat? This is the key question posed by a project launched by Finnish Energy (ET), Sitra and Turku Energia, with the aim of identifying ways of improving the competitiveness of district heating. The project aims to identify whether the district heating system can actually be opened up to two-way trading. Two-way trading means a district heating company opening up its system to the heat production output of its customers or other companies, and paying the market price for such heat. As decentralised and building-specific energy production become more common, the project participants are exploring opportunities for connecting decentralised production to district heating systems. Future business models need to be supportive of market development and of cost-effective, decentralised production that attracts investors. District heat and district cooling are vital to future energy systems. Finland is a world leader in the related technology and the expertise required for using and optimising such a system. “Increasing the opportunities for two-way trading will improve the effectiveness of the district heating system and provide ways of meeting the challenges of decentralised production,” says Sitra’s Leading Specialist Jaana Pelkonen. The goal is to further improve the competitiveness of systems based on district heat. “The project is helping market players prepare for the change, while promoting the development of two-way trading. 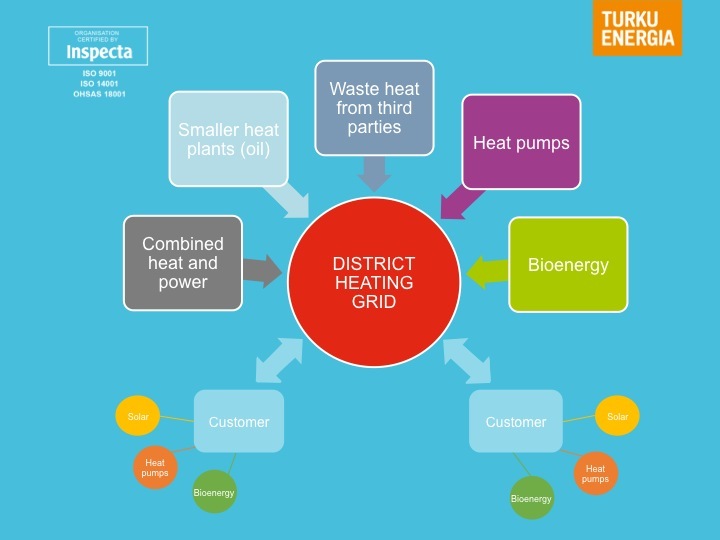 It is essential that all district heating customers benefit from the new business models. Both customers producing heat and district heating companies must benefit from two-way trading,” says Adviser Antti Kohopää of ET. The project is seeking to identify the pros and cons of various business models for each party. Other aims include identifying the environmental and climate-related benefits of two-way trading, the type of political steering that might stimulate such trading, and what aspects need to be taken into account in pricing. Implementation of the general component of the project is being handled by Pöyry Management Consulting Oy and co-funded by ET and Sitra. Alongside this, Turku Energia will be implementing a case study of the business model to use in the residential area of Skanssi. “Turku Energia is developing a low-temperature district heating network for the residential area of Skanssi. It is the first of its kind in Finland. If realised, it will enable the two-way and open trading of heat while increasing the use of renewable energy sources in our company’s district heat production. The case study will provide us with an operating model that can be applied in the creation of a market for the two-way trading of district heat in Skanssi,” says Antto Kulla, Development Manager at Turku Energia. Finnish Energy (ET) is an organisation championing an industrial and labour market policy for the energy sector. It represents companies that produce, acquire, transmit and sell electricity, district heat and district cooling and offer related services. Finnish Energy is responsible for the management of collective agreements covering the personnel of member companies, provides advice and training for members, and draws up reports and disseminates information. Finnish Energy promotes the competitiveness of Finnish industry, citizens’ well-being and the reputation of the sector by taking part in the development of the energy market and safeguarding the availability of sufficient and continuous energy to households and industry. Turku Energia is one of Finland’s largest energy companies. In 2014, turnover was 254.4 million euros and the average number of staff was 297. Turku Energia is the leading seller and distributor of electricity and heat in Southwest Finland. Operations also include the development, construction and maintenance of energy networks and power plants. Turku Energia is involved in the development of electric transport in the Turku region. They provide energy services, which safeguard the environment, improve the quality of life and promote competitiveness, to 130,000 households and companies. Turku Energia’s customer promise is: “”We are near, we see far”.